Scores of Starbucks cafÃ©s in South Korea have this month eliminated plastic straws on a trial basis as the South Korean government pushes shops to use fewer disposable items. The move to provide paper straws instead of plastic ones, a two-month trial that started Sep. 10, came after a law went into effect last month mandating the use of mugs instead of plastic cups in cafÃ©s across the country. Single-use items, especially those made with plastic, have become a great sustainability concern around the world, with South Koreans and others becoming more conscious of the environment at both the individual and national levels. Starbucks said in July it planned to phase out plastic str aws from all of its 28,000 locations worldwide by 2020, replacing them, in part, with a "strawless lidâ resembling a sippy cup. 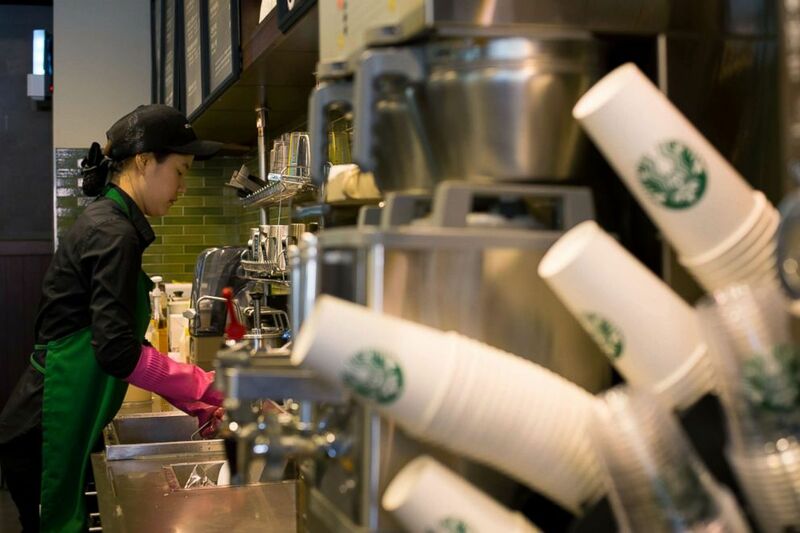 A barista washes at a sink inside a Starbucks Coffee Korea Co. store in Gimpo, South Korea, March 7, 2014. South Korea's Ministry of Environment on Sep. 4 announced a plan to produce zero waste in stores by 2027. The government has encouraged companies and individuals to reduce waste by not using wasteful materials in the first place, primarily those considered difficult to recycle, like plastic straws and single-use paper cups â" a practice called âprecycling." Various corporations, like Starbucks and the South Korean coffeeshop chain Angel-in-us Coffee, ar e carrying out initiatives to put the calls into action. While Starbucks Korea's current trial is limited to 100 stores, a spokeswoman for the company told ABC News it aims to replace all straws with paper ones by the end of the year. âIt feels a bit weird â"- I feel like Iâm drinking with a pencil,â Seo Jung-won, a customer at a Starbucks in Seoul, told ABC News, sharing his first experience with the straw. Seo said it felt unfamiliar but necessary. The recent policy has not only replaced straws â"- it has also replaced plastic cups in stores. Since last month, itâs been mandatory for all cafÃ©s in the country to provide mugs to all customers except those taking drinks to go. A spokeswoman for Starbucks Korea said the use of mugs had definitely increased. âOur goal is to produce as [little] waste as possible,â she said. A Starbucks worker cleans the window next to a company logo at a coffee store, May 31, 2006, in Seoul, South Korea. Other companies and consumers in South Korea are also making the efforts to eliminate disposable items. The Picker, a South Korean grocery store and cafÃ©, practices âprecyclingâ by not creating waste in the consumption phase. Its customers are advised to carry their own bags or containers for grocery shopping and drinks, and if needed, The Picker provides PLA-based containers. PLA, which stands for polylactic acid, is a biodegradable material made from plant matter. The Picker adopted its idea from Original Unverpackt, a German supermarket that practices "free package" -- it does not provide unnecessary containers or wrappers. South Koreaâs environment ministry said it prefers to not have to mandate behavior when it comes to getting rid of disposable items. âWe encourage voluntary participation among corporations and consumers,â Park Jeong-cheol, an administrative official at the ministry, told ABC News.